Too Many Other Prestigious Awards to List (40~ Since 2002!)! 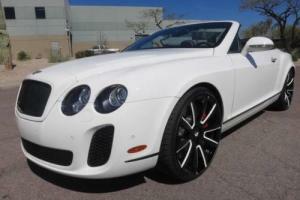 NOTE: Our listings not only describe this particular car but also some history of the make/model. considerations in buying a classic car and facts about our firm. However. we continually hear from out of state / out of country buyers (many of our clients) that they prefer the level of detail that we provide. However. if you are not prepared to read the full listing. please read the OVERVIEW below along with viewing the PHOTOGRAPHS at the bottom. If you'd prefer. 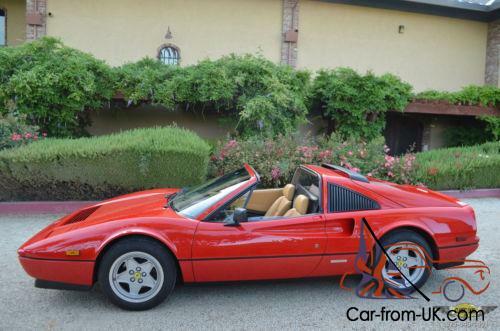 please call us at 925-846-1451 and we'll gladly discuss the Ferrari and answer any questions over the telephone. including our ‽Buy it Now” policy. And. yes. 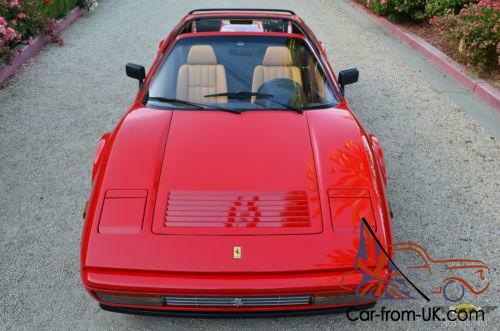 the Ferrari can be purchased prior to the end of the eBay auction. PLEASE NOTE: EACH TIME WE LIST A VEHICLE ON EBAY WE RECEIVE COMMENTS THAT THERE ARE NO PHOTOS OF THE INTERIOR. ENGINE. UNDERCARRIAGE. ETC. OF THE CAR. 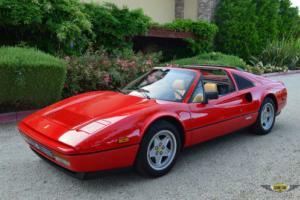 THERE ARE CLOSE TO 100 PHOTOS OF ALL AREAS OF THIS 328 GTS. BUT WHEN YOU REACH WHAT APPEARS TO BE THE LAST PHOTO. YOU WILL NEED TO SCROLL DOWN ON eBay TO VIEW THE REMAINING PHOTOS. IF YOU ARE STILL UNABLE TO SEE THEM. PLEASE CALL US AT 925-846-1451 AND WE WILL PROVIDE A DIRECT LINK. NOTE: IT IS A VIOLATION OF eBay POLICY FOR US TO LIST THE URL ON THE eBay LISTING. PLEASE LET US KNOW IF YOU WOULD LIKE ADDITIONAL PHOTOS OF ANY PART OF THE FERRARI. ALL OF OUR PHOTOS ARE TAKEN IN NATURAL LIGHT AND WE DO NOT ‽PHOTO-SHOP” OR TOUCH-UP THE PHOTOS IN ANY WAY. 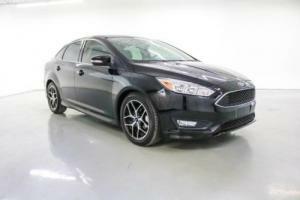 This car is offered at a realistic price and. unlike bidding on cars in an auction environment. 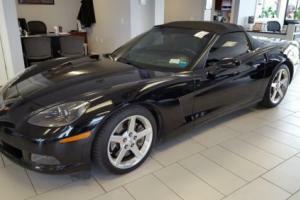 you will have the benefit of extensive information and history on the car prior to making a buying decision. Equally as important is the fact that Classic Cars Ltd. has been in business for 24+ years and enjoys an excellent national / international relationship with over 930 positive eBay feedback responses. Please keep in mind that we will gladly. 1. Answer any questions over the telephone and take the time to guide prospective customers through the buying process (925-846-1451). 2. Assist with locating a quality. suitable transporter at very competitive prices. 3. Provide proof that we are licensed. bonded (for the financial transaction). fully insured. and operate from an established showroom environment. Thank you again. please let me know if I can be of assistance. 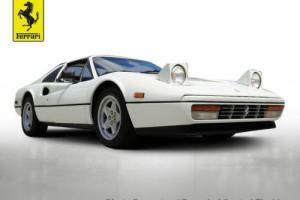 We do not believe it is an exaggeration to say that this Ferrari is arguably one of the finest 328 GTS' on the planet. It is in truly exceptional condition and is in the category of investment grade condition. The Ferrari is finished in desirable. classic. 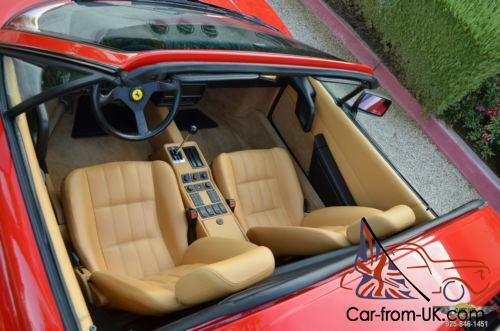 "Rosso Corsa” (Red) with tan leather interior and a black Targa top. as delivered by the factory. 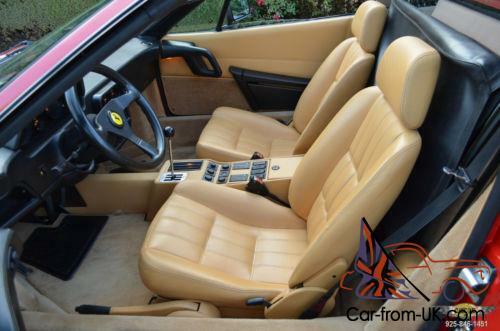 Both the exterior and interior reflect due to the obsessive care that this Ferrari has received since it was new. The comprehensive records and detailed No expense has been spared to keep it running in superb overall condition. and it runs strong just as it came out of the Ferrari factory. 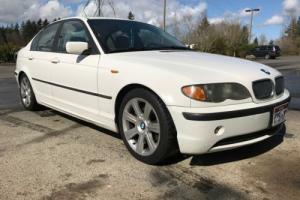 Unlike some examples with very low mileage that will require maintenance / service. or have been stored / unused for extended periods of time. this example has what many Ferrari aficionado's consider "ideal mileage. ” With just 45. 00 fanatically well-maintained miles. it has been used regularly. but sparingly. to ensure excellent operation at all times. The most recent major service was performed by Ferrari expert. Grand Prix Motors. Campbell. CA at 44. 33 miles (867 miles ago) in accordance with Ferrari recommended maintenance (including. but not limited to new Cam timing belts. valve adjustment. A/C & water pump belts and replacement. oil service. new hoses. complete inspection of fuel. braking. lighting and other systems). Additionally. the car received a fresh clutch and all new fuel injectors. The car has never had deferred maintenance and the extensive maintenance records (included) document the cars obsessive car for over 20 years. In addition to the proper mechanical condition of this car. it is in Concours condition cosmetically with recent (June. 2016) Concours judging of 99. 0 of 100 point. Historical results consistently scored the car well above 95%. 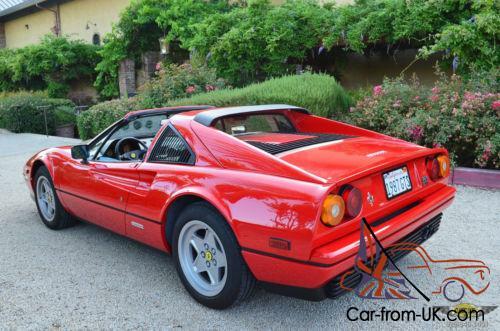 Not only is this 328 GTS a regular Platinum Ferrari Club of America award winning car. it is the only 328 known to have won Platinum as well as the Coppa Bella Machina award five+ consecutive years and another in 2015 with the Ferrari Club of America at the National Meet level. This car has also won the Club's Preservation Award. These are among the highest awards possible. 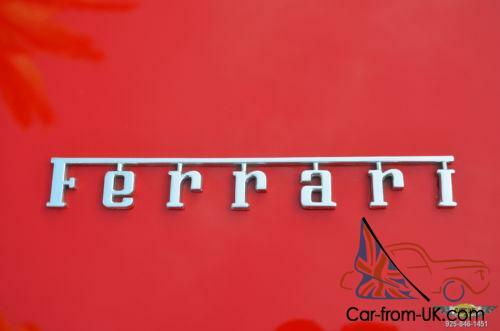 This car has been meticulously maintained in original specification just as it was produced by the Ferrari factory. This is important in the Concours d'Elegance competitions as originality is critical in Ferrari and other Concours judging. Particularly noteworthy is the cars show history during the past several years. In 2016. the car was recognized as "First in Class” at the prestigious Hillsborough Concours d'Elegance and also received a First in Class at another bay area Concours d'Elegance. Note: The Coppa Bellla Machina roughly translates to "Beautiful Machine Award" in Italian. It is one of the most treasured awards in Ferrari circles. To be honored as a Coppa Bella Machina. the car must function 100% as it did from the factory. This includes everything from the emergency brake holding the car on a hill to the lighting systems. 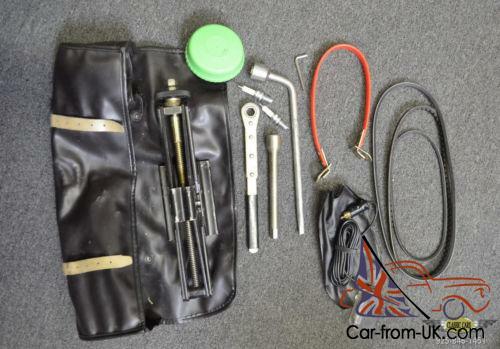 mechanical items and even the cigarette lighter! - Ed Gilbertson Award - In recognition of over 25 years as Chief Concours Judge of the Ferrari Club of America the Pacific Region. Ed Gilbertson. has established the "Ed Gilbertson Ferrari's are Meant To Be Driven Award" to recognize those active club members who regularly drive their cars. This is an International Meet Concours Award. The Award honors Ed and his philosophy that "Ferrari's are meant to be driven". 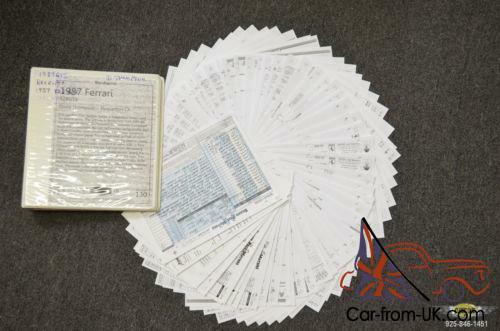 The ownership history documents the delivery of the Ferrari to its first owner by Cavallino Classics. Scottsdale. AZ. 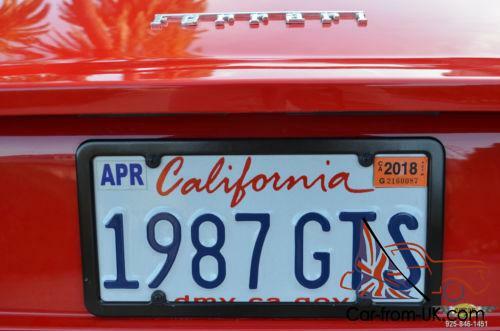 on 8/22/87 328 GTS. The original Owner's Warranty & Service Book reflects the VIN #. Engine #. and Ignition key # (original keys included). 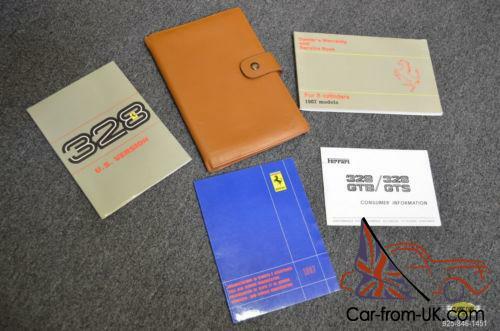 It also contains stamps for servicing by Cavallino along with a major service performed by the Ferrari of San Francisco during the ownership by the cars subsequent owner. Additional extensive service records document ongoing maintenance through 2017. 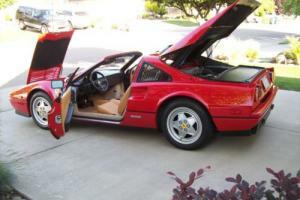 The Ferrari has been in Northern California since 2000. when it had 20. 00 miles. 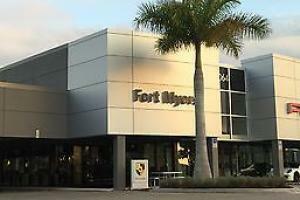 The cars 2nd owner retained ownership from 2000 to 2013 when it was sold to the current owner. a long-time Ferrari enthusiast. 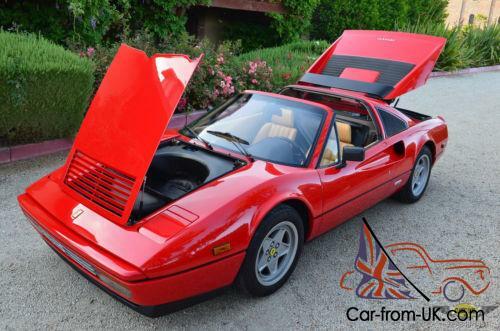 The cars current owner has only added a few thousand miles to the 328 GTS and has continued to show the car and maintain it to the highest standards. The Carfax report shows a totally clean history and consistent mileage progression leading to the cars current. low mileage. It reflects a recent history of passing California's stringent smog inspections. The car is currently registered in California until 4/8/18 and. of course. carries a clean unencumbered title. In a word… striking. The recognition that the car has received in Concours settings reflects its cosmetic condition. Cars this original are literally impossible to duplicate and this car remains totally stock in virtually every respect. Not only is the car properly configured. it retains factory original paint. no history. or signs of current or previous accident damage. rust of other significant flaws. The car is extensively documented and has just had a major service within 850~ miles so it is ready to be used and enjoyed. or shown at National level Ferrari gatherings. or local shows / events. With the exception of normal wear. replacement items. the Ferrari retains the majority of its original components including wheels (unmarked). Pirelli P7 tires. factory spare. tools. manuals & books. keys. and much more. 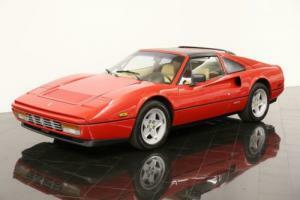 This particular 328 GTS runs and drives extremely well and is solid. rattle free. and mechanically strong. It starts immediately easily. has high oil pressure when cold and warm. does not overheat. and has just had the benefit of a major service by a professional Ferrari repair facility. The 328 pulls strongly through all gears and has excellent. linear power. The clutch is excellent. free from slippage or issues. and progressive. The gearbox reflects the cars low mileage with excellent synchros. and the often problematic 2nd gear syncromesh not being a problem. even when the car is cold. The brakes are effective and the steering and chassis are tight and precise. The air conditioning blows cold and heater and controls are fully functional. The car runs cool even in California's warm climate and has been totally reliable. The interior is correct and in exceptional condition throughout. The seat upholstery and dashboard are totally original and in lovely condition with no defects that detract from the beauty of the interior. The carpets are in excellent condition. The instruments and controls are in excellent condition. as is the center console. all of which appear are in original but incredibly well preserved condition. 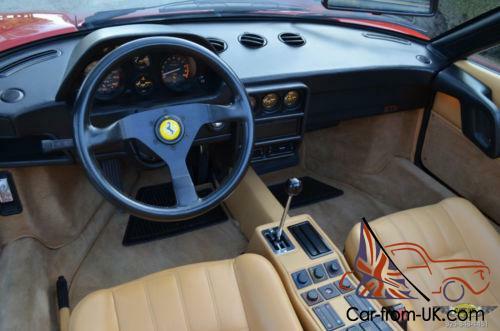 The steering wheel is a stock Ferrari item with a yellow Ferrari logo horn button. The car is fitted with a radio that is hidden behind a door” in the center console (shown in photo). The engine compartment. trunk. and front compartment are all immaculate and have not been criticized in Concourse judging. They remain correct in appearance. The engine is totally clean. free from leaks and originally configured. The factory air-box remains in place with factory correct semi-gloss finish and decals. The front compartment is in excellent condition and there are NO indications of any current or previous accident damage. The car has the proper plastic liner. fuse covers. and original spare with factory proper Goodyear tire (never used). As the preferences of the new generation of collectors emerge. 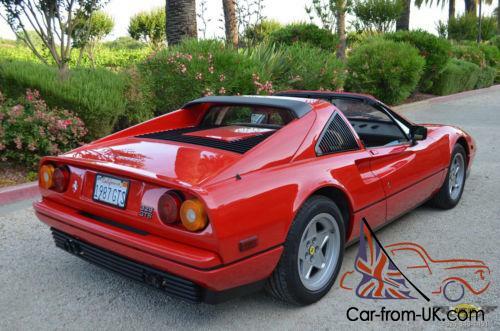 the 328 GTS is proving to be a popular model with strong investment potential because of its relevance to this buyer group. 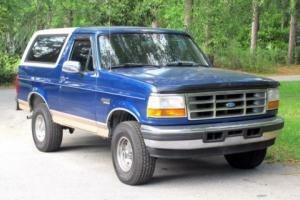 Values and interest in these cars is clearly increasing with documented sales of honest”. high quality cars in the $100. 00 range. This car represents a rare opportunity to own a totally unmolested show quality example of an original. limited owner. fully documented. 45. 00 mile 328 GTS. at an attractive price. 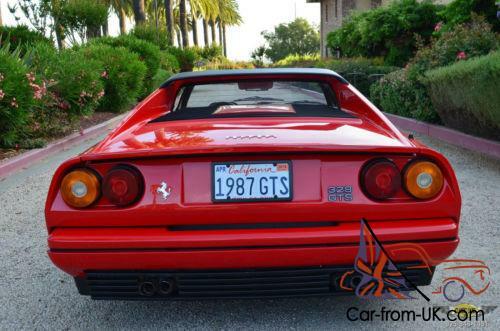 The Ferrari 328 GTS is the successor to the Ferrari 308 GTS largely based on the 308 GTS. modifications were made to the body style and engine. including an increase to engine displacement to 3. 2L (3185 cc). 7. 13 Ferrari 328s (6. 68 in GTS form) were produced by the time the model was replaced by the new 348 in 1989. 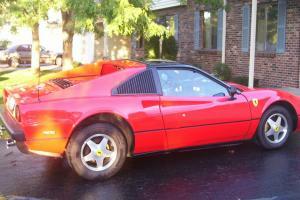 The 328 is considered by many Ferrari enthusiasts to be one of the most reliable Ferrari's; unlike some models. most engine maintenance can be performed without lifting the engine from the vehicle. The GTS is a Gran Turismo Spider (Targa top). In 1985 the 328 retailed from $58. 00-$62. 00 ($145. 00-$153. 00 in 2016 dollars) in the United States. This price included a gas-guzzler tax. 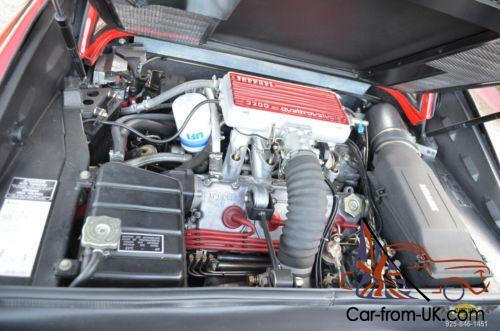 The 328 GTS model is the final development of the normally aspirated transverse V8 engine 2-seat series. The 328 figures in the model title referred to the total cubic capacity of the engine. 3. 2 litres. and 8 for the number of cylinders. The new model was introduced at the 1985 Frankfurt Salon. 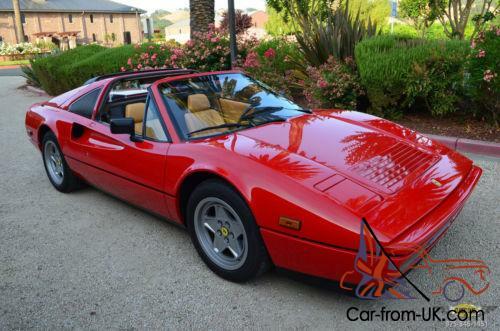 Essentially the new model was revised and updated version of the 308 GTS. which had survived for eight years without any radical change to the overall shape. albeit with various changes to the 3-litre engine. The 328 model presented a softening of the wedge profile of its predecessor. with a redesigned nose that had a more rounded shape. which was complemented by similar treatment to the tail valance panel. The revised nose and tail sections feature body color bumpers integral with the valance panels which reflect the work done concurrently to present the Mondial 3. 2 models. with which they also share a similar radiator grille and front light assembly layout. All eight-cylinder cars in the range share fairy unified front and rear aspects. providing a homogeneous family image. The exhaust air louvers behind the retractable headlight pods on the 308 series disappeared. coupled with an increase in the size of the front lid radiator exhaust air louvre. which had been introduced on the 308 Quattrovalvole models. while a new style and position of exterior door catch is also provided. The interior trim also has a thorough overhaul. with new designs for the seat panel upholstery and stitching. revised door panels and pulls. together with more modern switchgear. which complements the external updating details. Optional equipment available was air conditioning and a rear aero foil. The 328 GTS model has a tubular chassis with a factory type reference F 106 MS 100. Disc brakes. with independent suspension via wishbones. coil springs. and-hydraulic shock absorbers. are provided all round. with front and rear anti roll bars. There are various world market models. each having slight differences. with right and left hand drive available. •	Weight: 2806. 5 lbs. -	Classic Cars Ltd. has been in the same. small. California town for over 24 years. We operate a small. highly specialized "brick & mortar". indoor showroom. with a focus on the sale. consignment. and purchase of sports. 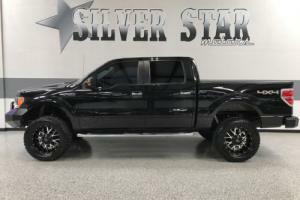 high performance and specialty vehicles of all types. We have a particular interest in sports cars and unique vehicles. -	The majority of our vehicles come from local. private owners and collectors. and many were sold new in California. We appreciate that rust free cars. with excellent documentation and history are especially attractive to our buyers both locally. and around the country. As a result. we do not purchase our collectible cars from "distressed" sales. such as wholesale auctions. salvage sales. or lien sales. 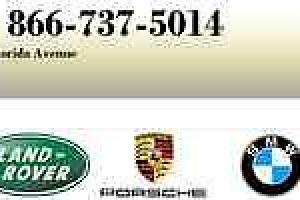 We do not sell vehicles with salvage titles. or those that have a history of significant accident damage or repair. - We have sold hundreds of unique. classic and collectible vehicles and regularly deal with buyers that have not had the experience of purchasing a large (both physically and monetarily) item on eBay. or through an Internet source. Our eBay feedback is 100% positive on all vehicle sales from customers around the globe and is a reflection of our commitment to accurate. complete. and thorough vehicle descriptions. -	We have been shipping vehicles for years and have established excellent contacts that are not only high quality but very price competitive. We do not use brokers. terminal shipping or other discount methods. Call us or email for a quote directly to your home or office. We are often able to obtain quality enclosed transportation (the kind of travel this car deserves) for the cost of open shipping. -	Please review our feedback on eBay (user name Never22Many) representing over 930+ positive transactions to buyers all over the United States / World. -	We are fully insured. bonded. 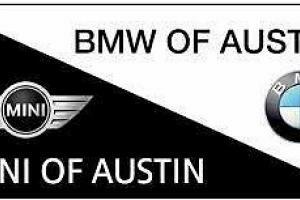 and licensed for collector car sales all over the United States/World. 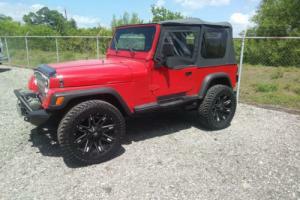 -	We frequently sell vehicles to out of State / out of country buyers. and will be glad to provide references for buyers in your area. 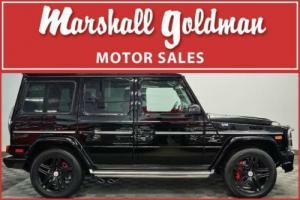 - As with virtually all collector/specialty vehicles. 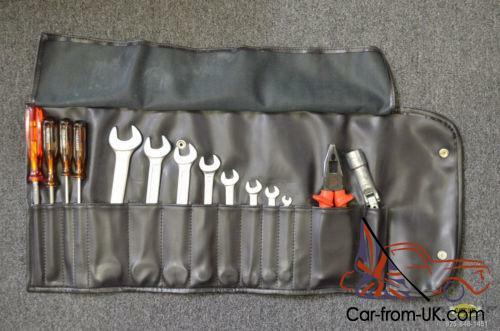 we find that parts and resources are readily available for this (and most every vehicle). thanks in large part to the Internet. 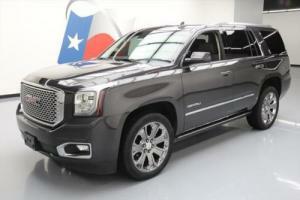 -	In addition to the purchase price of the vehicle. California buyers will be subject to sales tax. a documentation fee. DMV transfer fees and license / registration. Out-of-state buyers will be responsible for the purchase price of the vehicle and any local taxes/fees will be the purchaser's responsibility to pay in their respective state. IMPORTANT NOTE: If the vehicle is delivered or driven in California and driven on California roads. sales-tax. license/registration and transfer fees will be assessed per California law. - While we encourage telephone calls to discuss this vehicle in greater detail we will not respond to inquiries asking "What is the reserve". Also. if you would prefer that we call you to answer any questions about the vehicle; shipping alternatives. etc. please e-mail us with your telephone number and will gladly get back in touch with you. - We encourage inspections of this Ferrari by serious. qualified individuals or professional inspectors. Please call at 925-846-1451 to arrange a convenient time. - As an exotic sports car. we are unable to provide a warranty or guarantee of condition. However. we make every effort to accurately represent our vehicles. and highlight both positive items as well as areas that require attention. We ask that prospective buyers consider our eBay history/feedback. standing in the community. length of time in business. and other factors when purchasing a collectible vehicle from Classic Cars Ltd.
-	Minor cosmetic issues/flaws may be present on every vehicle (regardless of cost) including small chips. nicks. scratches. etc. that can be seen on even the best restoration. or even a relatively new. used "pre-owned" vehicle. -	The information contained in this description is believed to be accurate but. in some instances. has been provided by the car's owner. previous owners. or outside sources. As a result. we are unable to guarantee the accuracy of the information. We encourage verification of "numbers" and significant data prior to the purchase of any collector vehicle that you are considering. Buyers outside of California will be responsible for a $195. 00 fee for processing/administration. The charge will apply if the vehicle is purchased through ebay or before or after the auction. directly through Classic Cars Ltd.
Out of state buyers are responsible for the high bid and any shipping costs. California buyers are subject to the appropriate sales tax. DMV transfer. 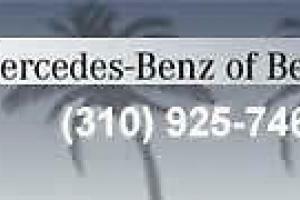 and fees associated with the purchase of any used vehicle sale in the state of California. To avoid shipping the title with the car to our out of state buyers. we mail the title via Priority Mail. While shipping and transportation costs (if appropriate) are the responsibility of the winning bidder. we can assist with locating a suitable transporter. We regularly ship cars all over the USA/World. and can often times locate very competitive rates for transporting vehicles door to door. to a local terminal. enclosed. open. etc. Please call us for specific information/rates to your location. We meet some great people and fellow enthusiasts. and only rarely do we have problems with non-paying bidders. Please be certain that you are prepared to buy the car if you bid. 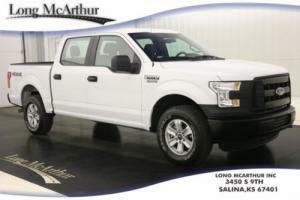 or call us at 925-846-1451 before the end of the auction if we can answer any questions. If you have a "sunglass" rating or fewer than 10 feedback ratings on eBay. please call us before you bid so that we can discuss the bidding process. etc. If we do not hear from you. we reserve the right to delete your bid.